I am very pleased to announce that, a couple of months ahead of schedule, the first StorycastRob anthology is now available! 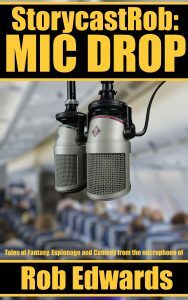 Called StorycastRob: Mic Drop, it collects stories from across the lifetime of my podcast, the blog, and my contributions to RB Wood’s Word Count Podcast, together in one place for the first time, It is available for Kindle from Amazon right now. 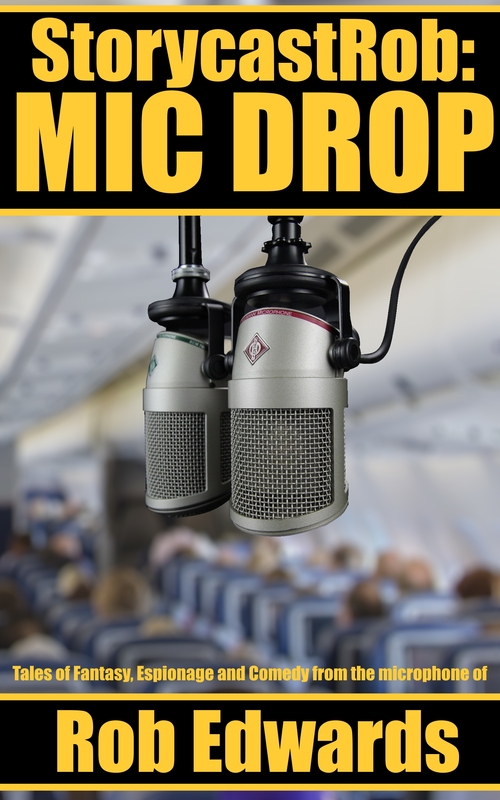 Special Offer: all StorycastRob patrons on Patreon will receive a free copy of Mic Drop this December. If you want to support the podcast and get a free book, join now at Patreon. Last week I introduced you to a short fantasy comedy sketch I wrote and recorded for my Patreon subscribers. Today we are going to finish off with, traditionally, part two. However, to make sure that my Patrons are still getting added value, this version skips over a subplot where Tuomo finds a magic ring and sings a song about it. For that, you’ll need to sub! If you’ve not seen it yet, check out Part One, and then, on with the tale! ABNER: Well there we have it. It’s taken six hours, but we finally have the treasure sorted. HILVI: We know how long it took, we were here. HILVI: It was the will of Lady Gloridia. ABNER: – we have sixty thousand shillings and around seventeen thousand crowns. ABNER: It is, indeed, an impressive haul, my fur-footed friend. BRADDOX: Well we better be getting to packing. We work high value to low. Gemstones first, then jewellery, then fill out with as much coin as you jam in. ABNER: Wise words, my axe-wielding friend. But, may I offer an alternative? ABNER: As you must surely appreciate, I am an old man, stoop-backed from decades of study. The Staff of Tumult is not merely my weapon but is an aid to my walking. I cannot hope to carry the same amount of bulk as one as mightily-thewed as yourself. BRADDOX: Thank you very much. ABNER: Welcome, welcome, my sturdy-headed friend. What I am suggesting is that we should organise our loads so that each of us would carry the same value. I would take the lighter, more valuable items, but you would take the heavier bulk. That way, should we be separated, each will retain his fair share. HILVI: Plus ten percent for Gloridian tithes. BRADDOX: [suspiciously] I don’t know, seems like I’m doing more heavy lifting for the same reward. ABNER: Not disproportionately, I assure you. BRADDOX: Oh, not disproportionately? I see, I see. Well, I suppose. As long as I don’t have to carry the disproportionates I suppose that’s okay. TUOMO: I only have this small pack. I could leave some of the cooking utensils out to make room for the treasure. But I’d want my share to compensate for the loss of cookware. ABNER: [Through gritted teeth]. Cookware. Of course. So all we need to do is calculate the load distribution so that I carry lighter things, Hilvi carries a ten percent bonus for Gloridia, and Tuomo is compensated for the loss of pots. BRADDOX: And no disproportionates for me. ABNER: Quite so. Well that seems… simple enough. HILVI: Let’s start by filling Tuomo’s pack, to see how much he can carry? ABNER: And finally, coins. How does that feel, Tuomo? Too heavy? BRADDOX: Good lad. We’ll finish up in here, go get the horses ready. BRADDOX: Okay, now he’s gone, can we talk about how ridiculously small his pack is? Even you must be able to carry more than that, Abner. ABNER: Well, I suppose, if it came to it… particular enchantments could be used to enhance certain physical attributes. Temporarily. BRADDOX: We will talk about that later. 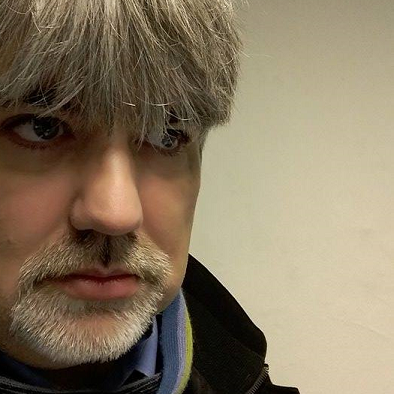 HILVI: Are you really suggesting we dupe Tuomo out of an even share? BRADDOX: It’s not really duping. We just loaded him up with enough cash to buy his brother’s stupid pub four times over, even if he melts half of it down to make bloody solid gold pots. It’s just… we’d have more. ABNER: Well that seems to settle it, then. Pass me the bag, I’ll start loading up. HILVI: Yes, I’ll take one too. The sooner we get out of here the better. Gloridia isn’t going to worship herself at evensong. BRADDOX: I don’t have any bags. I have all these weapons and armour, bags would just interfere with my swing. Don’t you two have bags? HILVI: Why would I need bags if I have no worldly possessions? BRADDOX: Fine. Just… we’ll just use the saddlebags on the horses. Easy. HILVI: We should have used those in the first place. BRADDOX: Shut it. Not a word about this to Tuomo, agreed. BRADDOX: [a little removed, shouting after Tuomo] Hey! Tuomo! We’ve had a great idea. Bring the horses around, we’ll use their saddlebags. BRADDOX: [Still calling from a ways off] Tuomo! Tuomo! Bloody hell. He’s buggered off. And he’s taken the sodding horses. Thanks for reading! If you enjoyed that, leave me a comment, and maybe we will revisit this world, or this format, in the future! Time for something a little different. Trying something experimental for the latest Patreon podcast, I thought I’d turn my hand at a little scripting. What resulted was a ten-minute sketch about the aftermath of an adventuring party slaying a dragon. Here’s the first half of the script, check back next week for the second half. TUOMO: Is— Is it dead? BRADDOX: It had bloody well better be, Tuomo. Can someone find a stick or something to lever its head off my legs? Abner get over here and use that staff of yours for something useful. HILVI: We would all be charcoal. We understand, Abner. ABNER: Well! I would have thought better of you, Hilvi. A man of the cloth should respect his elders. TUOMO: But, we did it? We killed a dragon? BRADDOX: It was no match for my axe, Flamedrinker. HILVI: Guided by the blessings of our Lady Gloridia, may her eternal light illuminate all we do. ABNER: And, need I remind you, shielded by the Staff of Tumult. BRADDOX: You needn’t remind us, and yet you’ve done it twice. TUOMO: I should probably name my weapons too. HILVI: Hold still, Braddox, with the might of the Lady Gloridia coursing through me, I will have you free in [STRAINED] no time. Tuomo, might you, perhaps, get underneath and give it a boost. And Abner…? ABNER: Yet again, I must save you all from follies of your own making. TUOMO: Treasure! Oh yes! I suppose we can take some? I mean we killed the dragon and all, that’s how it works, isn’t it? BRADDOX: To the victor the spoils, shorty. HILVI: With a suitable tithe to the church of our Lady Gloridia, naturally. The prayer sofas in the Dawn Room need reupholstering again. ABNER: And I must purchase rare and expensive ingredients of alchemical science to prepare a tincture to restore energy to my Staff. BRADDOX: Aye, there’s a bevy of professional ladies in Twinbridge who do the same for me. Tinctures cost extra. TUOMO: And I promised my brother I’d invest in his pub. We all need the money. But how do we share it? BRADDOX: And it will! (I talk in my sleep). ABNER: – scavengers will quickly claim what we have not. TUOMO: I suppose we start sifting then. Set aside the copper bits, take only shillings and crowns. HILVI: And bring any jewellery you find to me. My Lady Gloridia has blessed me with a jeweller’s eye, and a magnifying glass. I should be able to judge what is worth our time. BRADDOX: And what is not ‘worth’ bothering with? Maybe just a shiny for you to give to an orphan? Hah. Bring it to BOTH of us to look at. TUOMO: We can trust Hilvi, surely? He’s a priest. BRADDOX: Let me see how far I can throw him, then I’ll let you know how much I trust him. HILVI: Don’t let it disturb you, young Tuomo. The Lady Gloridia forgives his suspicions and his insults. I don’t, not necessarily, but the Lady Gloridia does. BRADDOX: What do you want? ABNER: My worst fears are confirmed. We must tread warily, for legends say that dragon gold is cursed. Those who seek it out may become consumed by the need of it. This magical compulsion can set brother upon brother, shatter friendships, burst fellowships asunder! ABNER: Fortunately, I have studied the curse’s effects, and believe I know how we may protect ourselves from it. TUOMO: How, Abner? Tell us. ABNER: With my arcane training, I believe I can resist the curse long enough… so if I take the gold and you guys the silver? Okay? HILVI: We’re not falling for that. ABNER: Well it was worth a go. BRADDOX: Just for that, you can start over at the back end of the dragon corpse. I’ll sift near the head. Tuomo, Hilvi, take a wing each. Check back next week for part two! If you’d like to hear my one-man staging of Loot!, join my Patreon at http://www.patreon.com/storycastrob and get access to bonus podcasts, a free annual ebook, and autographed copies of my books. New Book! New Podcast! New! There’s new things out today! First up, the latest anthology from Inklings Press is now available! The follow-up to our hit anthology Tales from Alternate Earths is here! 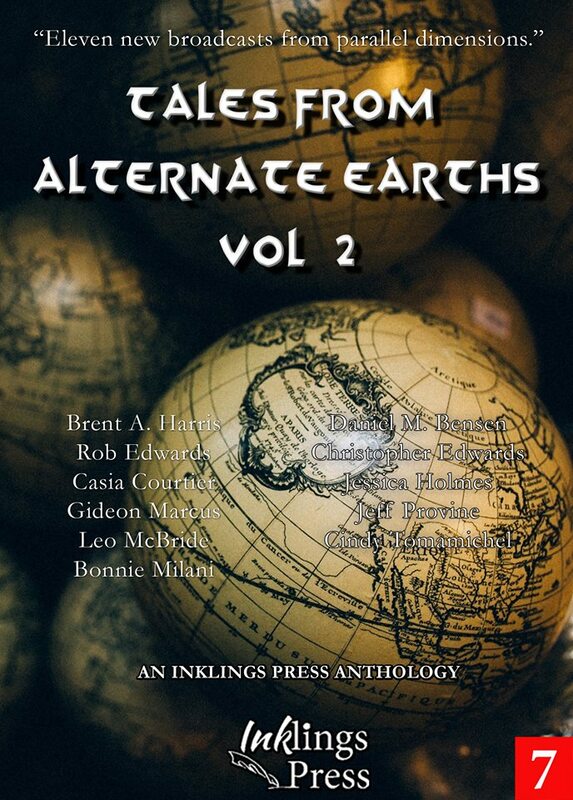 Tales from Alternate Earths 2 is available in Kindle format today, with the paperback due by the end of next week. In it, you will find ten stories of alternate history, secret history and other re-imaginings of our world. This includes my story The Emperor of the North, featuring a Finland gripped in an ice age. Also out today is the latest episode of my podcast. In this episode I read a creepy story from Jeff Provine, originally featured in the previous Inklings book Tales from the Underground. Listen to the episode here. 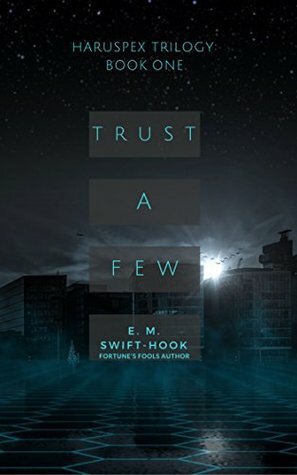 Trust a Few by E M Swift-Hook is the first book in the middle trilogy of a trilogy of trilogies. That may seem like a strange place to start, but I watched the original Star Wars in the cinema when it came out: so, let’s do this! Avilon Revid was a rebel and a hero, a terrorist and a pariah, but events led to amnesia and capture by the Coalition. Now he is trying to build a new life and a new identity after finishing his sentence serving with the brutal Special Legion. He goes in search of the one man he considered a friend in the Specials, Jazatar Baldrik. They had arranged to meet in Starcity, but Jaz is missing and Avilon finds himself alone in the underworld of the ‘city, with only a few years’ memories and a still developing sense of morality to guide him. 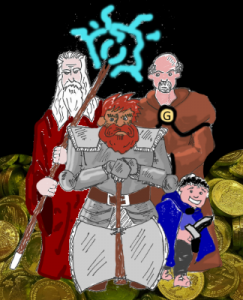 The adventure follows four main points of view: Avilon, Jazatar, Charis, a pilot fallen on hard times, and Durban a free-agent seeking Avilon for his own reasons. They must deal with each other and the web of criminality holding the ‘city together. The plot interleaves their stories nicely, juggling plot threads and cliff-hangers in switching POV. Expect action, intrigue and double-crosses. The world feels real and lived in, the tech, for me, explained enough without bogging down details, and the worldbuilding is deft. I particularly enjoy the idea of the ‘city selling itself as a tourist spot because of the levels of organised crime there. Did I ever feel out of my depth, starting in the middle of the story of this universe? Actually, no. Trust a Few is a great jumping on point for new readers, with plenty of interesting characters being victims of events clearly established in the book. One character does take a turn at about the two-thirds point of the book which felt a little out of nowhere, but I gather he was a character in the previous trilogy and events here are in keeping with that. So that’s not so much a problem, as a reason for me to seek out earlier books in the series. To sum up, if you want an intriguing sci-fi set in a grimy lived-in universe with interesting characters doing interesting things, then Trust a Few is well worth your time. Five stars! And if you want a taster, check out my reading a short story that ties into Trust a Few in episode 24 of my podcast! The latest episode of StorycastRob the podcast is available today. This features me talking about some of the classic audio drama I loved growing up, and two tales with a dark twist by a couple of great writers. Discover what thwarts Doctor Deathray’s latest plan! Learn why Willy Wonka is like Professor X! Listen to the start of my superhero novel! In the latest episode of my podcast, listen to two new stories by guest authors Claire Buss and E.M. Swift-Hook. And I give you my top five audio plays from Big Finish (after I exclude all of the obvious well known choices). At the very least, go watch my intro video, to see me out from behind the microphone and feeling vaguely uncomfortable! These days it seems like you can’t go grocery shopping without someone trying to show you a superhero movie. With three studios making Marvel movies, DC making Wonder Woman, Netflix shows, the CW’s Arrowverse, truly we are in the superhero golden age. But I’m here to tell you this goes back further than you might think. Many great movies of yesteryear are, at their core, superhero movies. Films that are only missing the technology to CGI a giant beam shooting at the sky in the third act to complete the deal. In this series, I aim to look at some classic movies and show you what might have been… if only they could show me the sky beam! Now, hold on, don’t get ahead of me here. I know what you’re thinking. “Oh sure, lone hero fights bad guys, swings around skyscrapers, throws quips, obvious!” But I’m not suggesting that John McClane is some sort of Batman/Punisher hybrid… I mean, he is, and I could stop right there. But I want to dig a little deeper than that, and show that down in its bones, Die Hard was really trying to be a superhero flick. Modern superhero movies have largely done away with secret identities, particularly on the Marvel side, but they are a big part of the genre. “I keep my identity a secret, so my enemies can’t target my loved ones,” says Spider-man, Superman, Flash, Daredevil… Well this is precisely what McClane does in Die Hard, adopting the identity of Roy Rogers so Hans Gruber won’t target his wife. I mean, as code names go, it needs work, but the idea is there. Point! He even maintains this secret identity when dealing with the police. Sergeant Al Powell in the film is basically Commissioner Gordon complete with moustache and high-powered lights. Welcome to the party, pal! Point! Again, look at the comic book roots of superheroes and you will see them travelling around with their costume on under their street clothes, so they are ready to burst into action at a moment’s notice. McClane’s costume, like his code name, needs work, but when he battles bad guys, he’s taken off his shirt to reveal his superhero costume underneath… an increasingly grime-ridden vest. Point! Okay, I conceded this point above, but come on, he swings on a rope/hose around the outside of a skyscraper. Also, there are quips. Double point! If all of that is not enough to convince you, we probably need to address the elephant in the room, and talk about the fact that the villains, and later McClane, all have superpowers. What!? I know, right? Buckle up, people, we’re going through the looking glass now. First of all, I want you to consider Gruber’s henchman Karl. If you don’t remember, he’s the big guy that McClane strangles with a chain after a brutal beat-down, who then appears alive and ready to fight at the very end of the movie, so Commissioner Al can shoot him. How does Karl manage to do all that? Because he has superpowers given to him by the special cigarettes that most of the terrorists use. These super-soldier-serum containing death sticks grant increased durability, strength, speed, but come at the cost of over-confidence and reduced empathy. Karl almost wrecks the plan right at the start of the movie by chain-sawing through the Nakatomi phone lines before his brother can isolate them. Why take that risk? Because he’s hopped up on cancer-ridden super-power-giving cigarettes (Don’t smoke, kids) and thinks he’s invincible. Surely that’s just one guy, right? I mean, yes, all the terrorists have a certain amount of swagger throughout the movie, but are they all suffering the side effects of the super drug? No. Theo the tech guy takes a dose before the movie, and starts a little hyper, but Gruber needs him to focus on the job so he isn’t allowed another dose, and slowly calms down over the course of the heist. By the time Argyl punches him his, Theo has lost the advantages and drawbacks of the serum. Still not convinced? Okay, try this. Both McClane and Gruber suffer the same side effects at different points in the movie, both after smoking the power cigarettes! Figure Two: John McClane. The smoking gun? 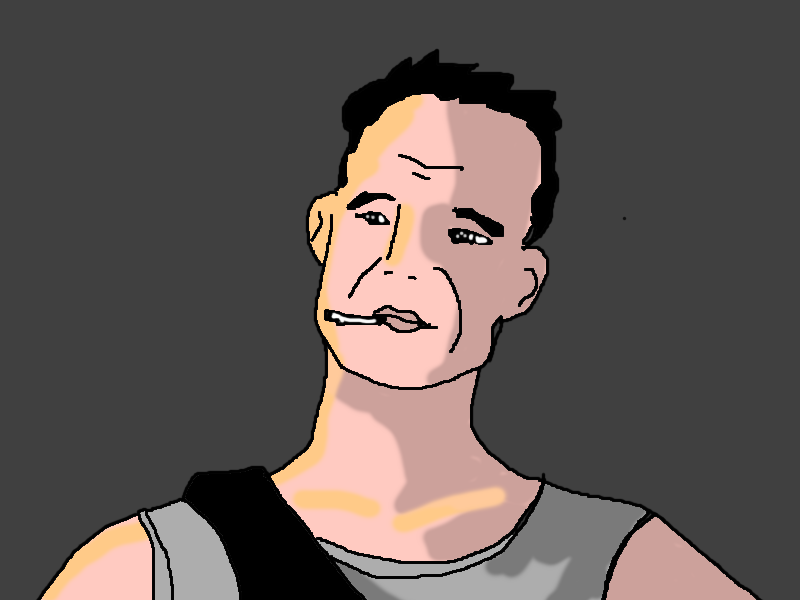 McClane spends much of the early movie just trying to stay alive. He keeps hidden, gathers information, feeds that to the police. He fights only when he must to save himself. Even when he sees Gruber execute Takagi, he has a very sensible reaction. “Why didn’t you try to stop him, John? Because then you’d be dead too.” Yet, later in the movie, after smoking the cigarettes he took from the first terrorist he beat, suddenly he’s all gung-ho about finding out what the bad guys are doing with the explosives, and strapping guns to his back. And he succeeds! Over-confidence and superpowers. Likewise, Hans is in control, goal-oriented and calm, until he meets McClane near the roof, shares a cigarette, and suddenly he’s all controlled rage, threatening Holly and falling out of windows. Over-confidence and… superpowers? Harder to be sure on that, but he’s facing off against the hero at the climax of the movie. Like Spider-man/Venom, Superman/Zod, the now super-powered McClane is facing off against a similarly-powered dark reflection in Gruber. I think the case is compelling. We’re just lucky Gruber didn’t gain the power of flight. Die Hard is clearly a superhero movie, I think we’ve proved that now. 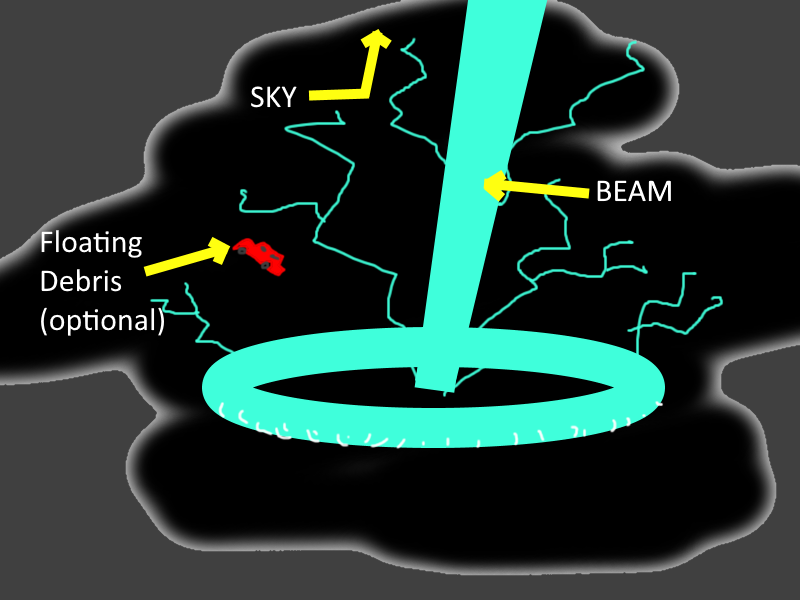 What you may not realise, is that it tries hard to include a nascent sky beam in the film. It’s already in there, something shooting up from the ground to the sky, occasionally with dramatic light shows, explosions, debris and helicopters circling it. That’s right people, we didn’t have the CG for a sky beam, but Nakatomi Plaza is trying its hardest to be one anyway. Boom! Looks like we’re going to need some new FBI agents, because that’s got to be hella points! So, there we have it, clear proof that, for want of a proper sky beam, Die Hard is a superhero movie. Also, a Christmas movie. Join me next time, when we look at Charlie and the Chocolate Factory and ask… is this just Justice League? Show me the Sky Beam! 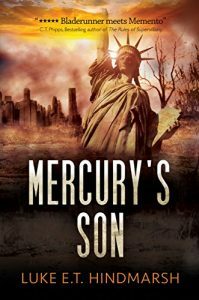 My last indie read of 2017 was Luke E T Hindmarsh’s Mercury’s Son, and while it’s unfair to pick a favourite from such a diverse and fascinating array of books, this one, I have to say, rings all the right notes for me. Valko is a Moderator, a cold passionless investigator who was technology which lets him enter others’ minds to draw out information, including the recently deceased. He and his team are called in to investigate a double murder, an investigation which will take Valko to all levels of his society, planet, and beyond. In this book, Hindmarsh builds a hugely detailed dystopia, and uses the Moderator’s investigation to show off its tech, history, politics, religion and metaphysics. It’s an impressive feat, and Valko is a fascinating protagonist, his journey leaves him very much changed as he comes to terms with a world that is not at all what he believed. Mercury’s Son is a great read, but I do offer one caveat. The writing is dense, there are a whole lot of words on display, and on occasion this can lead to a few wobbles in pacing. That aside, this is a cracking read, and I’m happy to give it five stars. Get Mercury’s Son on Amazon now! Colin Bull on Did the Genie cheat Aladdin out of a wish? proptech on Dare the Lair! StoryCastRob on Did the Genie cheat Aladdin out of a wish? Jim on Did the Genie cheat Aladdin out of a wish?